Ondo State governor, Arakunrin Oluwarotimi Akeredolu, SAN, has reiterated the commitment of his administration to maximum protection of lives and properties in the state. Governor Akeredolu said it’s also expedient to put in place necessary security architecture that would enhance all-round development of the state and protect the citizen and investors operating in the state. 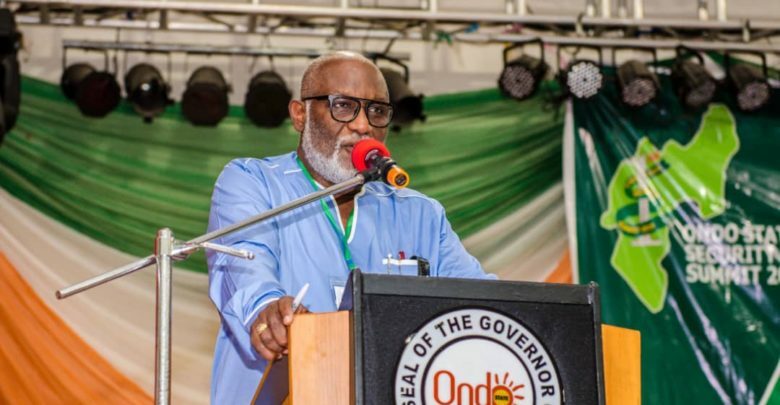 The Governor spoke at the opening of the first Ondo State Security Summit held at the International Culture and Events Center (DOME) on Thursday. He stressed that his administration is embarking on ambitious programmes of massive infrastructural development to create an enabling environment which will transform the state into an industrial hub. Akeredolu who said the summit , with the theme “Improving the Security Architecture of Ondo State for Sustainable Peace and Development”was aptly captured, expressed his expectation to have a robust discussion at the summit which will herald the desired change in the security framework of the state. The Governor disclosed that his administration is donating vehicles for the security agencies in the state so as to enhance their job of protecting lives and properties of the people. ” We possess sufficient understanding to appreciate that there can be no development without peace achieved through a sustainable programme of securing lives and property. “Government in the State has always been providing all it takes to ensure the security of lives and property. The current realities establish, clearly, the near-impossibility of total reliance on the Government to achieve this lofty objective. “The provision of adequate security is capital intensive and, consequently, we need to involve all well-meaning individuals to ensure that the environment is free of crime. The lead speaker, Prof. Femi Odekunle commended the state government for the convocation of the summit in apparent response to recent spikes in new patterns of criminality in the state. He noted that there is an indisputable relationship between security and development, adding that the planning for security must be seen and treated as part and parcel of planning development. One after the other, speakers at the summit took turn to present different papers on Security.